When I am at a loss for an explanation in the world of electronics, I reach for my well-thumbed Horowitz & Hill. When H&H fails me which is not that often, the chances are I’ll find myself looking in an application note from a semiconductor company who is in cut-throat competition with its rivals in a bid for my attention. These companies have an extensive sales and marketing effort, part of which comes in the dissemination of knowledge. Razor blades may be sold to young men with images of jet fighters and a subtle suggestion that a clean-shaven guy gets his girl, but semiconductor brands are sold by piquing the engineer’s interest with information. To that end, companies become publishing houses in praise of their products. They produce not only data sheets that deal with individual device, but app notes documents which cover a wider topic and tell the story of why this manufacturer’s parts are naturally the best in the world. These app notes frequently make for fascinating reading, and if you haven’t found them yet you should head for the documentation sections of semiconductor biz websites and seek some of them out. Tiny motors used for haptic feedback and vibration come in a variety of shapes and sizes. The most familiar is the “eccentric rotating mass” (ERM) variety which just spins an imbalanced weight on a small motor and comes packaged in two form factors. The classic is the pager “pager motor” which just looks like a tiny, adorable motor and the squat cylindrical “pancake style”. ERMs are simple to use but provide imprecise response when compared to their new-age cousin the “linear resonant actuator”. Unlike the motor in an ERM, LRAs are typically an enclosed mass on a spring placed near a coil which pushes the mass back and forth. The name LRA might not be familiar but Apple’s branded implementation, the Taptic Engine, might be a little more recognisable. [Precision Microdrives] is a vendor of these sorts of devices who happens to have a pleasantly approachable set of application notes covering any conceivable related topic. A great place to start is this primer on ways to drive motors with constant voltage in a battery powered environment. It starts with the most simple option (a voltage divider, duh) and works through a few other options through using an LDO or controller. 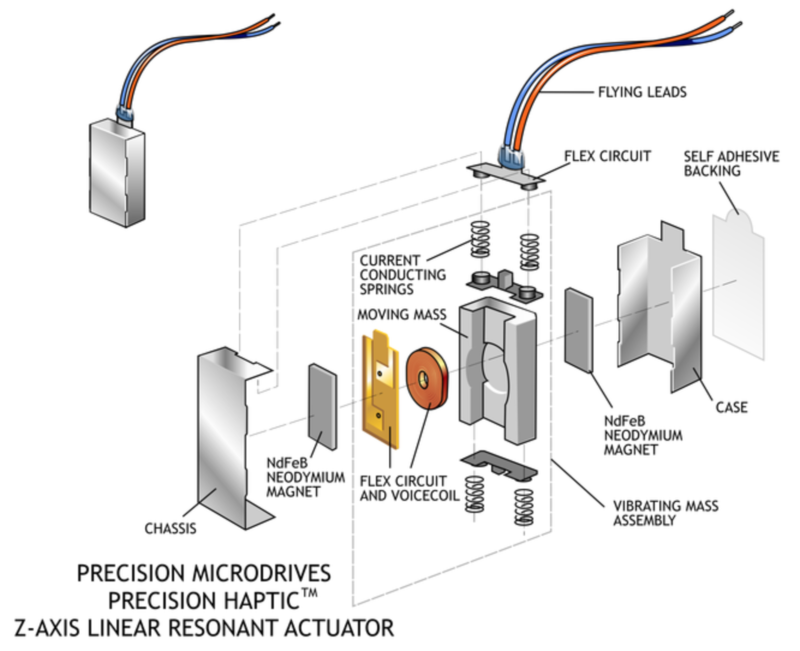 If you’re thinking about adding haptics to a project and are wondering what kind of actuator to use (see: the top of this post) AB-028 is a great resource. It has a thorough discussion on the different options available and considerations for mounting location, PCB attachment, drive modes, and more. Digging around their site yields some other interesting documents too like this one on mounting to fabric and other flexible surfaces. Or this one on choosing PWM frequencies. Now we don’t sit around reading application notes for fun. But if hard pressed we would have to admit that we do read quite a few of them even if the concepts aren’t currently on our project list. That’s because they’re a great way to learn stuff and for the most part the information within is trustworthy. The latest one that we looked at is this Maxim app note 5681 on recycling Lithium-ion batteries. It’s more a reuse than a recycle but you get the point. If you have some Lithium-Ion cells left over from older equipment this resource delivers a lot of good information on how to use them to power something else. Obviously they’re showing off their own hardware here, but that’s okay. The MAX8677A chips has a ton of features and can be had for $3-5 depending on your vendor. It automatically switches between powering your device from the battery, or from the charging source if connected. This allows you to source up to 500mA when connected to USB or 2A when charging from an external DC supply. There is also all of the protection you would normally want with a Li-ion setup, including temperature monitoring. The catch is the not-so-hand-solderable QFN package. They’ve got a solution to this as well. The diagram on the right shows how to hand solder the chip — albeit with a hot air pencil — by drilling through the board to get at the ground pad from the underside of the PCB.